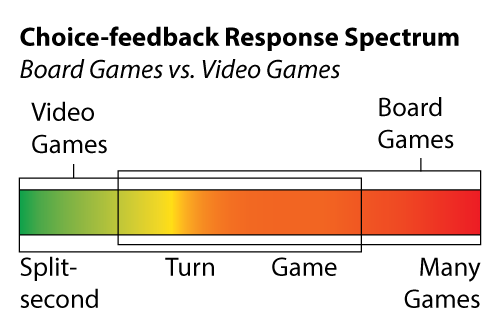 At their core, games are about feedback. 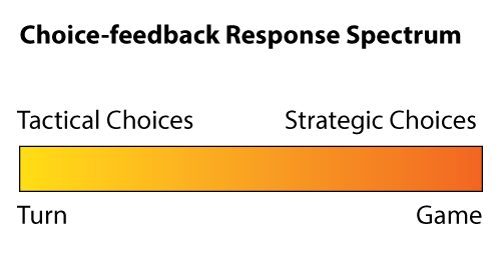 They are systems in which, when a player makes a choice, the system gives feedback as to the quality of that choice. In Call of Duty, that choice might be "Do I fire my gun or not?" In Magic, it might be "Do I attack with this creature or not?" 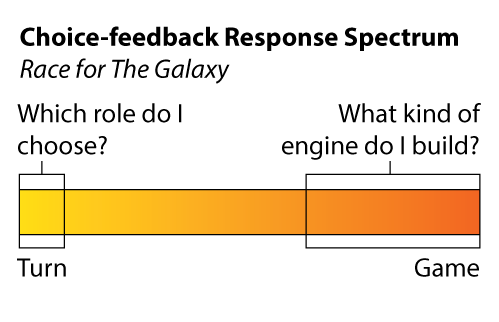 In either case, after making the decision the player receives fairly quick feedback. In the former case, the game shows her visually (and also aurally) whether or not she hit. In the latter case, the player's opponent makes a decision and show her whether or not attacking was a good idea. 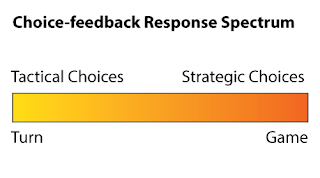 The response time for feedback varies between differing types of choice. 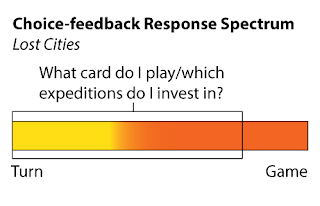 In a board game, a player might perform an action and get feedback on that action within the same turn (for example, most bidding games work like this). There might be another choice she makes about which she gets feedback at the end of the game in the form of victory or defeat (for example, choosing which strategy to pursue in most engine building games). 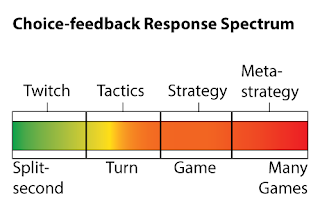 If this is starting to sound familiar it should, as I wrote about it three weeks ago in my post about tactics and strategy; we call a choice for which feedback happens within the same turn a tactical choice, and we call a choice for which feedback takes a whole game a strategic choice. Lost Cities has lots of tactical choice and some strategic choice, but they are all provided for by a single set of mechanics! 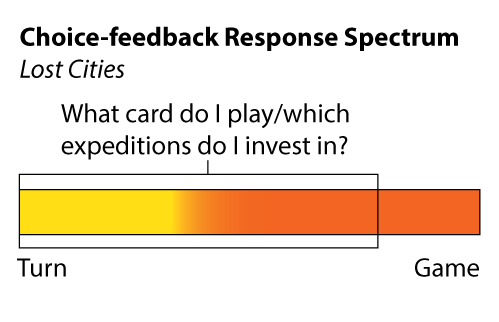 Where I'm going with this is that in addition to being used for analysis of individual games, this spectrum is also useful for analyzing broader types of games. 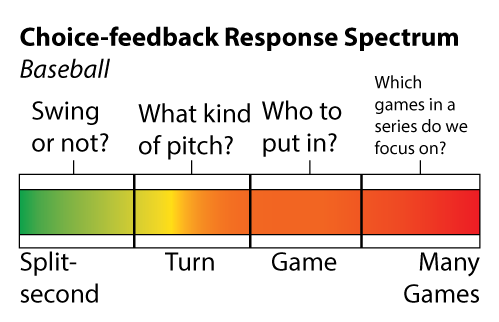 As we've already seen, sports and e-sports tend to be full spectrum games. We're used to board games focusing on tactics and strategy, not uncommonly stretching into metastrategy. 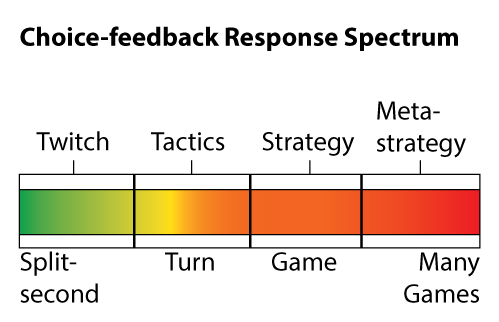 We usually expect video games to focus on twitch and tactical choices, not uncommonly stretching into strategy. Now, video games can obviously contain metastrategy, and board games can sometimes have twitch choices, but video games focusing on twitch and board games focusing on strategy is one powerful convention that many games conform to. 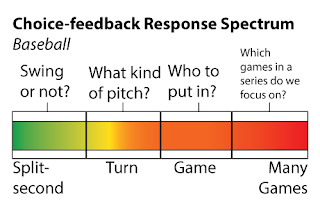 This can help us as designers understand games at a broader level. In the past I've written about how "default actions" (not requiring players to make strategic actions on their turns) help casual board game players handle strategy board games. I propose that this is because many people aren't interested or equipped to make strategic choices, including many video game players. And this is why video games tend not to include much strategy or metastrategy (when compared to the amount that board games include). 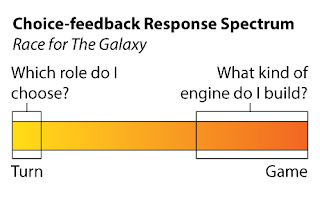 Understanding this allows designers to better understand intersections of audiences. For example, I've found that many of my board gamer friends also enjoy rogue-like digital games. 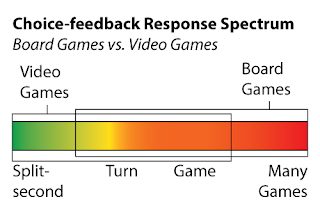 This can be explained, in part, by this understanding of strategy and conventions of board games; on the spectrum, rogue-likes look much more like prototypical board games than video games. Rogue-likes also tend to conform to other board game conventions, like being turn-based. I'm not trying to say that rogue-like games are board games. It's simply useful for designers to have a framework to talk about game conventions and manipulate them consciously. 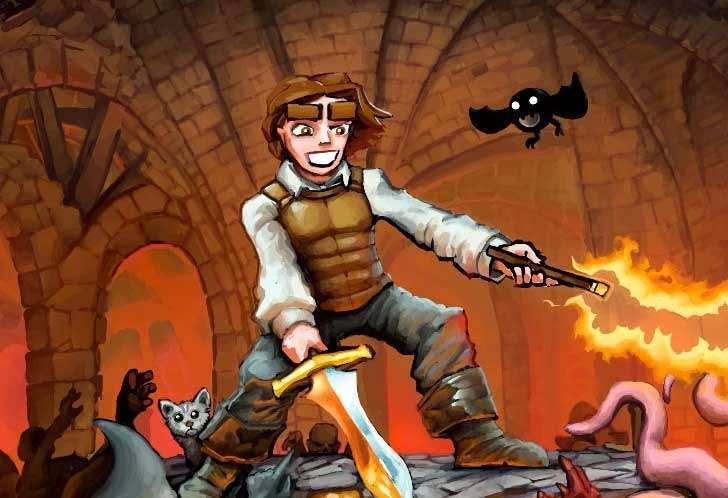 As nondigital games become more and more digital, being able to experiment with porting video game conventions to board games (and vice versa) is going to be extremely valuable.